The people that live behind me have a hot rod on the concrete pad where the house's detached garage used to stand. This car, as you can tell, looks like somebody's pet project. It has a nice paint job, complete with flames on the sides, but is in an unknown state of repair. Now, we've had a wild winter, with lots of windstorms. After each one, the blue tarp (which =never= stays on the car, I'll point out) is worse for wear. 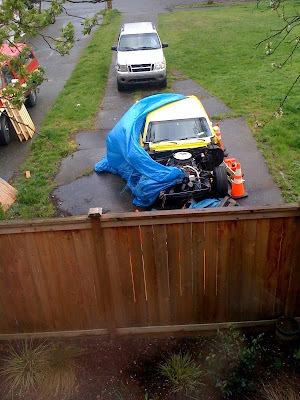 At the beginning of the winter, it had a small hole over the engine; now the tarp threatens to rip itself in two. As you can see here, the tarp is tenuously attached to the car. Days or weeks after a storm, someone mysteriously pulls it back over Ol' Yeller. I don't know what kind of car it is (the make or year). Or even if they'll ever finish it. But we're taking bets on when the tarp will be done for.